LAND ACCESS – You have several decent sized farms you’ve deer hunted on where you hear coyotes on a regular basis, so you think you have enough land to be a coyote hunter - wrong. Being regularly successful at coyote hunting requires an enormous amount of land access; more than most guys would ever imagine. I personally have at least 250 accessible stand locations in multiple counties, from Southern to Central Ohio. These are organized in an Excel sheet and divided into numerous routes. FINDING COYOTES – Most guys target wood blocks and thickets primarily, which can surely hold coyotes, however, don’t over-look the unobvious. Coyotes by nature like open country and will bed in the very slightest of cover, including drainage ditches, fence rows, grass tufts around power line poles, grassy waterways, crop fields, pastures, or anywhere else there is just enough cover to hide them. I have killed a lot more coyotes in areas with less heavy cover than around large swaths of timber. LOCATING COYOTES – Coyotes, like turkeys, will respond to a variety of noises such as trains, sirens, dogs barking, etc. If/when trying to locate coyotes, try using a siren on your e-call instead of a coyote vocal first. In many cases, this will get them to answer before having to educate them with running your call or making a mouth howl. Also, I have located coyotes with a mouth/diaphragm howl on many occasions when they would not answer howls from and e-call. Tone and pitch can be a huge factor in whether or not coyotes will answer and give up their location. Lastly, coyotes won’t always answer to howls. Just because they’re not vocal does not mean they are not in the area. PARKING THE TRUCK - Getting your truck parked without alerting coyotes can be a vital step in achieving success. Try to park away from the field you are hunting and sneak in if possible. Field pull-offs are the worst place to park at night, especially when coyotes are close. Try to park at a house, barn or somewhere where it is “normal” for cars to pull in to. If you have to pull into a field, do this with your lights off. Get unloaded quietly and gently push your doors shut. If setting up near your truck is your only option – go for it. I have killed many coyotes while standing within 50 yds. of the truck, however, this was after easing into the field with the lights off and being very quiet. STAND LOCATION – At night, setting up where you can see good is a lot more important than setting up near cover. Even on the brightest of moonlit snowy nights, I will set up in the middle of a field. Coyotes will not see you unless you let them come in well beyond gun range, or if you are moving around. Their strength is in their nose, not their eyes. Try to set up allowing yourself a 360 deg. shooting area any chance you get, or as much as you can safely cover. This dis-allows coyotes to sneak in from behind. I despise having my back against a woods or fencerow. WIND DIRECTION – Many people believe the best wind is one that is hitting your face. I would totally agree with that ONLY if I was standing backwards. My favorite wind is one that is hitting my back at an angle. I prefer a 10 o’clock or 2 o’clock wind direction. By nature, coyotes circle downwind of your call. 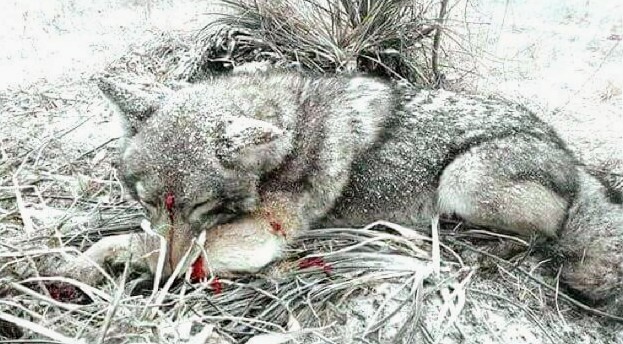 There are exceptions to every rule, but if you allow coyotes to come in downwind of your call, you will put a lot more dogs in gun range & more in your truck. You will need to off-set your call 30-50 yds. opposite of the wind direction so that they are not downwind of you (wind direction at 10:00, call direction at 2:00). I like to think of this as the 10:2 rule. It cannot always be done, however, I try to get as close to that as possible, and usually will not hunt a spot with the wind directly in my face unless there’s no chance of a coyote coming in from behind me. WIND SPEED – Quite possibly the least understood factor in the game. Wind speed can play a huge role in your success rate, from night to night. It is a misunderstanding that “less wind is better.” Coyotes like to use the wind to their advantage, so when there is no wind, they are at a disadvantage, and may not come in at all. My favorite wind speed is 7-12 mph. Anything over 20 mph makes for tough hunting as well. Anything less than 4 mph can leave you feeling dumbfounded if you do not understand this. COYOTE CALIBERS – Caliber choice is a hot topic in the predator community. From the .17 HMR up to the 6.5 CM have all become popular for killing dogs. If you are a furbearer, I would recommend choosing a smaller, more fur-friendly round, however, if you are like me and just trying to kill coyotes – go bigger. I started with a mediocre round and have found myself loving the .243, due to losing very few coyotes, if any. My opinion is that the .223 is almost too small, unless you are cooking up some hot custom rounds or, you are making perfect shots every time. Choosing a bigger, flatter shooting caliber such as the .22-250 or .243 also eliminates more bullet drop compensation and leaves you worrying a lot less about judging yardage, which can be a lot more difficult at night. CALLING STRATEGY – I won’t go into much detail here. I would have to write a separate article on calling strategy alone to even remotely tap into different strategies & theories per season. I will tell you this though – try to use calls that sound real. Set your call out at home and play all the sounds before you begin using any of them. Choose the ones that sound good to you. If it sounds fake to you, it likely does to them. Also, tell a story with your calls. Make a realistic scenario happen as opposed to playing random sounds while on stand, hoping they might work. Although certain situations call for changing my game plan, I normally know exactly what call sequence I am going to play before I load the truck.